Hi all, Im looking for a head count of all the Cape Town guys entering the competition. Ill be assisting with seeds distribution. Im out in the Northern Suburbs, but make often trips down south. Great light. more specs, please? What are you doing with your 800s now? Shot for the heads up, Ill sprinkle some diatomaceous earth over the topsoil. Aweh, TD. This is the sunny side of the house. The shaded side is going into flower already. Only flowering the indica dominant pheno. Hi Guys, My outdoor plant is growing well with no pests or the like. No chowing on leaves evident. With gentle rains received over the weekend, I noticed house flies chilling on my plants. Like quite a few of them. Don't know if they keeping the other baddies like mites at bay or just taking shelter? What's your guys' opinion? See image below. Outdoors always a challenge in the windy mother, but Ill give it a go. Im in. Thanks, @Budwizer, I fixed it with Epsom and AACT over the week. Bounced back beautifully. Shot gents. My soil mix was a bit too rich, so I broke it down with equal parts, coco, ewc, my soil mix & perlite. Didn't add lime for the extra coco. I think that particular strain was just more sensitive to the deficiency. IMO. Ill monitor and Epsom salts as per @CG420za schedule above. Pic below a week later. seeds What are you planning to grow next? I won't use it in my regiment only as a problem solver. Don't want to be killing off precious microbes. I'm a noob myself. The more you know, the more you realise how little you know. Hi Guys, One of the strains is showing some leaf discolouration. Not sure if is N deficiency or toxicity? It has a dark blue line running through it and become lighter on the edges. Image below. 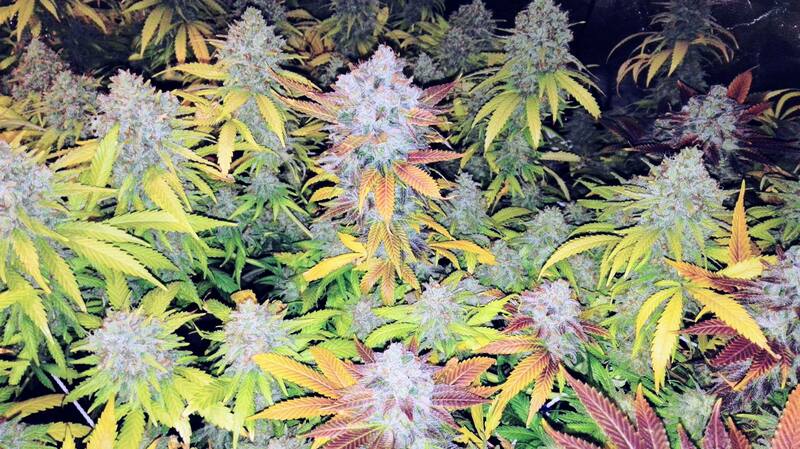 All the other strains with similar soil and watering regiment are growing as they should. Please help and identify what the issue could be? Images attached. Plant in question on the left.